During what was supposed to be a routine investigation in South America, NUMA Director Dirk Pitt finds himself embroiled in an international mystery, one that will lead him across the world and which will threaten everyone and everything he knows, including his own family. Pitt travels to Scotland in search of answers about the spread of an unknown disease and the bioremediation company that may be behind it. Meanwhile, his son and daughter face a threat of their own when the discoveries they have made in an Egyptian tomb put killers on their trail. 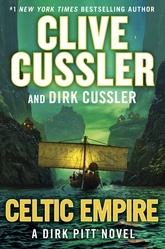 These seemingly unrelated riddles come together in a stunning showdown on the rocky isles of Ireland, where only the Pitts can unravel the secrets of an ancient enigma.